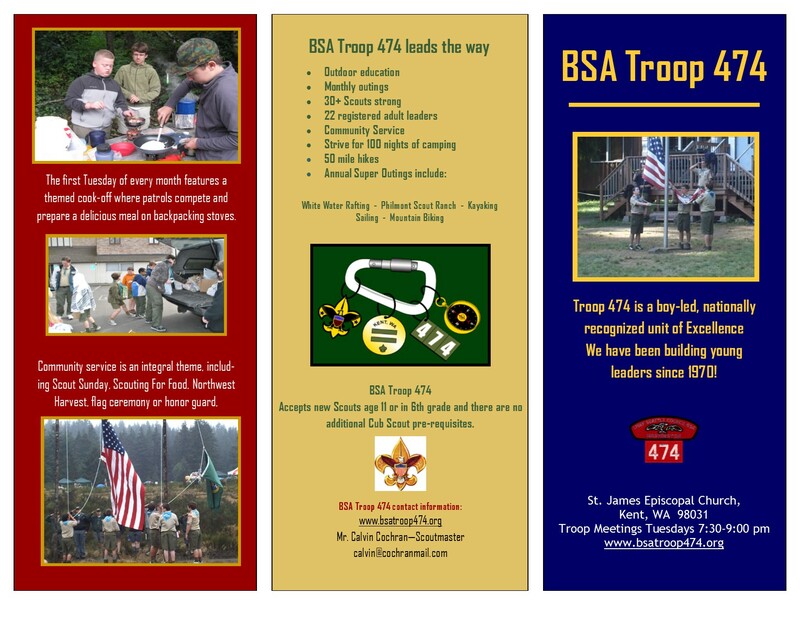 Troop 474 has existed for over 35 years in Kent Washington. The troop is sponsored by the St. James Episcopal. Mountain biking the C&O canal in Maryland to Washington D.C. The troop climbs Mt. Rainier and other local mountains. Troop members (scouts and/or parents) have also climbed some of the major mountains of the world, including Mt. McKinley (Alaska), Aconcagua (South America), and Mt. Kilimanjaro in Africa. There are also 50-milers, usually backpacking trips, cross-country ski trips around Crater Lake, and many, many overnight and weekend camping trips. There is an adventure out there for everybody!